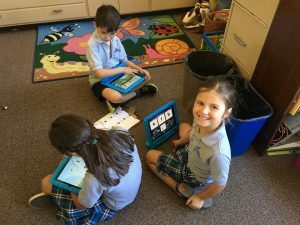 St. Justin School believes that technology is a tool for enhancing and developing student learning. This can be seen in one of our main tenets, our Schoolwide Learning Expectations. In order to ensure that students are learning, we have employed products that are vetted, well-researched, and designed with students in mind. In the elementary grades, teachers employ a variety of apps that support learning objectives and the curriculum. These provide individualized help for students who are struggling with key concepts as well as provide enrichment for students who have already mastered grade-level concepts. These apps are utilized in the computer lab and in the classroom. Lexia is an individualized reading program that precisely targets each student’s learning level and modifies instruction to meet his or her needs. It can be used on a laptop or computer by logging on to the website, or it can be used as an iPad or Android app. St. Justin piloted Lexia during Summer School 2016 and saw great success. It provides teachers with detail-rich data about student learning as well as provides instructions on how best to assist students in areas where they need extra help. 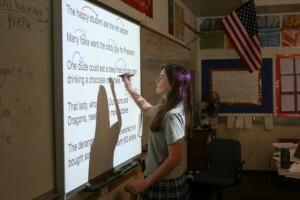 More information about Lexia is available at the company’s website: http://www.lexialearning.com/. RAZ Kids is a reading program in which students read stories and take quizzes online. It is based on A to Z reading assessments and motivates students to improve their reading by giving them points based on their performance. Students have the ability to move up to higher reading levels, and the teachers are able to track their students’ progress with the valuable data provided by the program. For more information, please visit https://www.raz-kids.com/. Mathletics is a game-based, individualized platform that rewards students for learning math concepts and skills. It is an individualized platform, designed to support students in their learning. Teachers use Mathletics to provide support for students and to supplement what they are teaching in class. For more information, please visit http://us.mathletics.com/. ABCya! is an online storehouse of educational games with topics ranging from early literacy to number games and geographical quizzes. The great depth of games and customization of these games heightens student engagement and excitement for the learning process. For more information, please visit http://www.abcya.com/. Grades 3-5 continue to use Lexia for Reading with the goal of “testing out” by the end of 5th grade. Grades 3-8 begin to work with Chromebooks. There are 10 of them in 3rd grade, and students in grades 4-8 have access to their own Chromebook. The suite of Google Apps for Education is utilized on the Chromebooks which stay at school overnight in locked charging stations. For more information on Google Apps for Education, please visit https://www.google.com/edu/. Both teachers and students use Google Classroom for assignment/document distribution and collection. Google Classroom makes it easy for teachers to create assignments, give them to students electronically, and then collect them. It fully integrates with Google Drive and Chromebooks. Each student has a Google Drive account, which allows students to create documents, slide presentations and spreadsheets. All of the students’ work is saved in their Google Drive accounts, and they are able to access their work at school or at home. Google Docs are the documents created for Google Drive accounts. They provide students with the opportunity to engage in word processing, and they can be easily shared with teachers and students for collaboration or peer editing. Google Slides is the presentation tool offered through Google Drive. Students use it to create engaging presentations and are able to share their presentations with group members without having to be in the same location. In addition to using the wide array of products available from Google Apps for Education, students use Accelerated Reader to improve their reading skills. Accelerated Reader is an independent reading program in which students read printed books and then take quizzes on those books. They earn points based on the books they have read and the scores they earn on the quizzes. The program works with students to set individualized goals and provides feedback as to how they are meeting those goals. 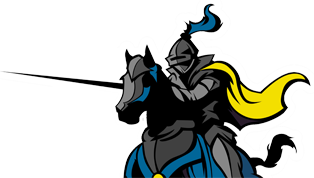 For more information on Accelerated Reader, please visit the website at http://www.renaissance.com/products/practice/accelerated-reader-360/. 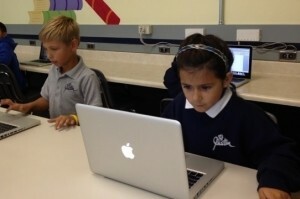 In 4th grade, students are introduced to Quizlet, an online quiz program. Quizlet is one of the best apps for student learning as it assists them to recall important vocabulary, facts, and dates. Quizlet automatically creates notecards that can be utilized on a Chromebook, laptop, iPad, or a smartphone. It allows students to focus on terms that they find difficult, and it gives students the option to learn as a speed game. Students at St. Justin have used it successfully for three years. For more information, please visit Quizlet’s website at https://quizlet.com/. Grades 5-8 also use an online adaptive math program entitled ALEKS (Assessment and Learning in Knowledge Spaces). It is an assessment and learning system that uses adaptive questioning to quickly assess a student’s mastery of key concepts and then targets training and skills based on this assessment. It is also capable of reassessing students on previously learned material to ensure that all skills and concepts are retained. For more information, please visit https://www.aleks.com/about_aleks. IXL is an online learning company that provides a wide array of educational products. Middle school teachers use IXL primarily for grammar exercises, in which students can complete exercises projected on the front screen independently at their desks. For more information, please visit https://www.ixl.com/. The middle school grades also use Desmos, which is an online mathematics platform. It provides several online exercises and games. Students often complete online challenges. In addition, we utilize the website Estimation 180, which requires students to make a daily estimate about a given picture. Students find it engaging as they try to make accurate estimates. For more information, please visit https://www.desmos.com/ and http://www.estimation180.com/. St. Justin School also offers a Science, Technology, Engineering, Arts, and Math (STEAM) club once a week to interested 7th and 8th graders. Students learn the basics of computer programming, robotics, and 3-D printing design. The club utilizes coding courses from code.org, a LEGO Mindstorms robot, and a New Matter 3-D printer. For more information on these products, please visit https://code.org/, http://newmatter.com/, and https://www.lego.com/en-us/mindstorms/products/mindstorms-ev3-31313.